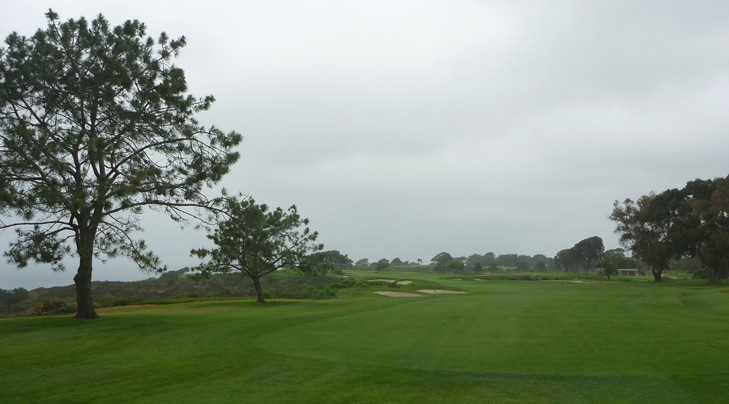 Torrey Pines South Hole 1: The golfer is not afforded the luxury of easing into the round as the first hole is long, with a narrow fairway between two bunkers. It then bends right to a narrow green between two deep bunkers. 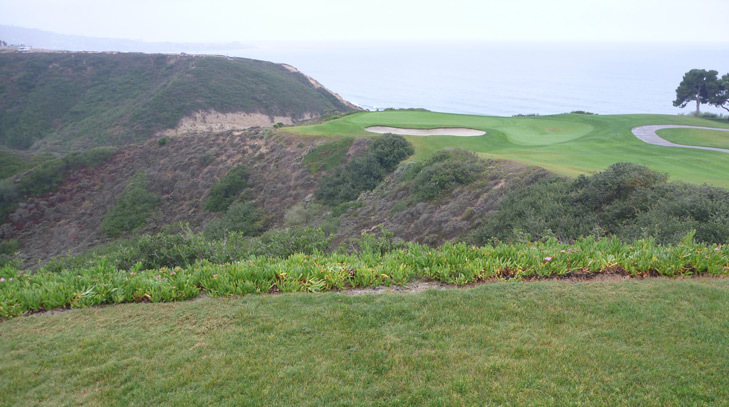 Torrey Pines South Hole 3: This famous par three is downhill with hazard short, left, and long of the green, and ocean views galore. 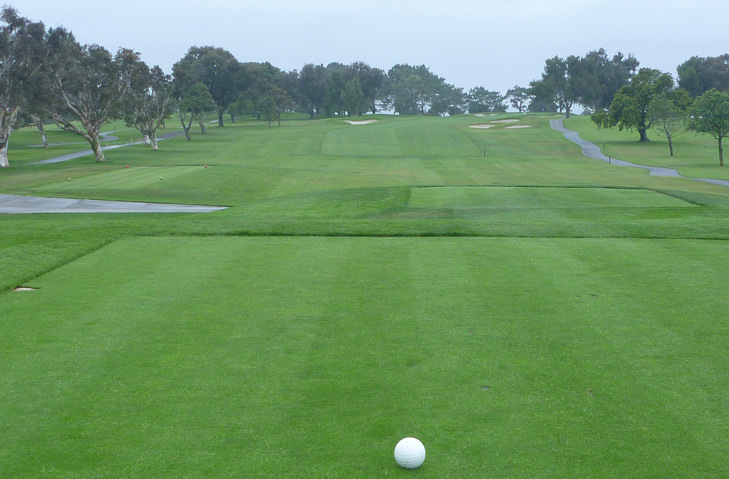 With the prevailing wind usually in the golfer's face, club choice is difficult and critical. Torrey Pines South Hole 4: This brutal par four is almost unfair in its difficulty, but makes up for it in a visually stunning golf experience on the Southern California coast. It requires a long drive between the cliffs left and the bunkers right. Even the long hitters will have a mid iron at best to a green perched on the cliff with an enormous bunker in front. Any left pin placement is inaccessible to all but the very best golf shots. 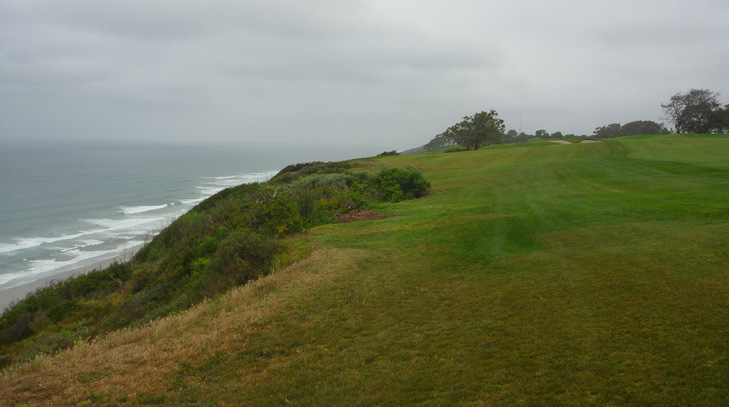 Torrey Pines South Hole 6: This relatively short par five plays downwind and offers a breather after a tough stretch of golf holes. Much easier for a fade, the drive must be placed between the string of bunkers on the left and the canyon (only in play for a bad push) on the right. The rest of the hole is straight forward and the green is relatively wide open to receive a long shot for those going for it in two. Torrey Pines South Hole 7: Torrey Pines fights back after the relatively easy 6th hole with this difficult dogleg right par four. The farther to the left the drive goes, the longer the approach, but better the angle to the green. The right side is shorter to the hole, but may have to flirt with large trees and has a tough angle to some pins. Torrey Pines South Hole 12: Long and into the wind, this par four is straight and unremarkable (other than the ocean views of course). However, any par here is indeed remarkable given the length and difficult bunkering. Torrey Pines South Hole 13: What I consider the most unique golf hole on the course features a drive (from the pro tees) that is over a canyon. With canyon left and bunkers right, the drive must be straight and long. Then the second shot will likely find its way into a deep valley where all but the strongest golfers will have to play their third shot, uphill to a green between a series of huge bunkers, and one that has three distinct putting levels. 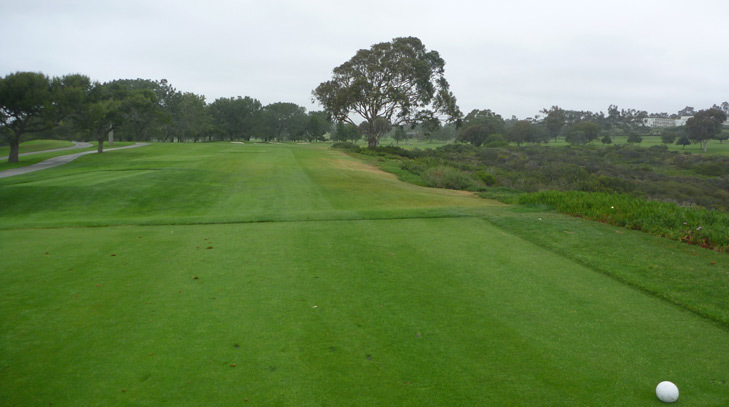 Torrey Pines South Hole 14: From tee to green, this golf hole requires precision. The player can bailout to the right a cliffs and bunkers left are visually daunting. However, a drive left of center is strongly preferred, especially for any pin cut back or right of center. The huge bunker front-right of the green is prominent and the cliffs lurk just behind the putting surface, making any shot long an monumental mistake. 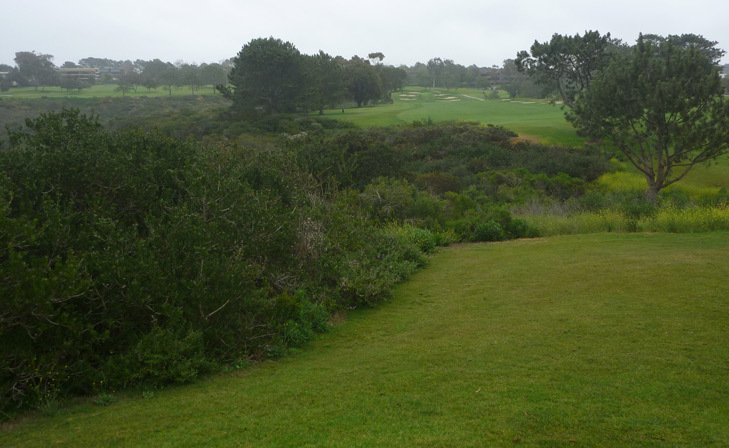 Torrey Pines South Hole 16: The last par three of the day has decided many a PGA playoff. The hole features very good bunkering and a lot of undulation in the green. From the pro tees, the angle is also more nasty as it can come from over the bunker on the left, which makes stopping the ball on the green very tough. Torrey Pines South Hole 18: This golf hole has seen some of the most professional golf drama in the last decade of any hole on earth. In "real" life, it is fairly straight forward and the trick is solely avoiding hitting it into the water on the approach. The green is not large, but for the golfer only looking for par, the hole isn't too dramatic. 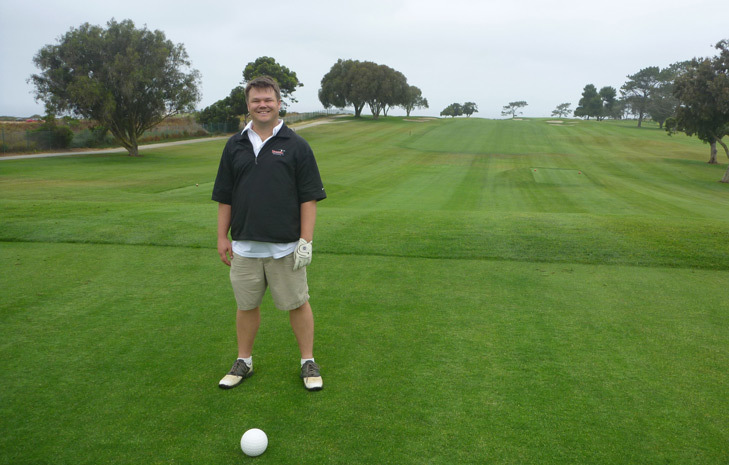 Now read the Torrey Pines North Course Review.